I’m sure it’s still cold where you’re at now. This stew is the perfect comfort food. 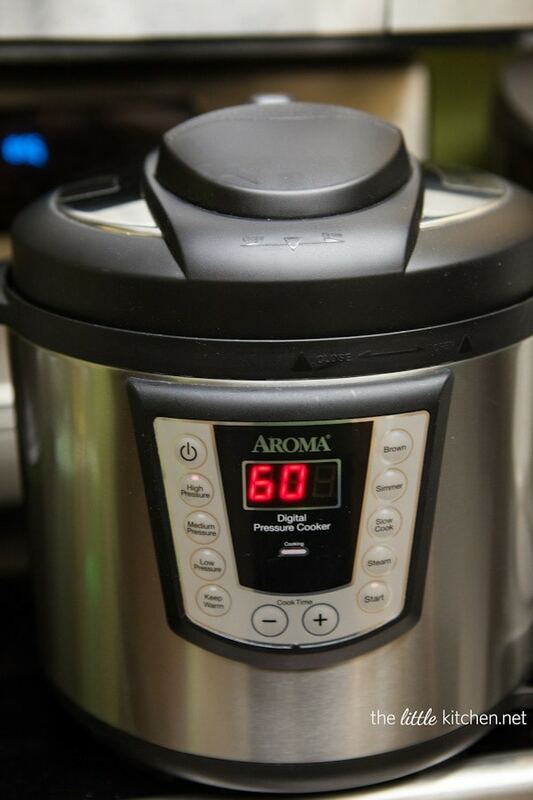 Last year, Aroma Housewares sent me a digital electric pressure cooker. I have been experimenting with recipes using the pressure cooker and I’m loving it. You can have dinner on the table fairly quickly and since it’s electric, you can feel comfortable using it. I love it! Then, cut up the beef. I even removed a lot of the fat pieces from the beef. Add salt and pepper. Cover the beef in flour. Turn the pressure cooker on and set it to brown. Add 25 minutes to the timer and hit start. Add the beef and brown it in two batches. Don’t be scared. I was too but it’s really easy to use and I’m going to use it for dinner more often. 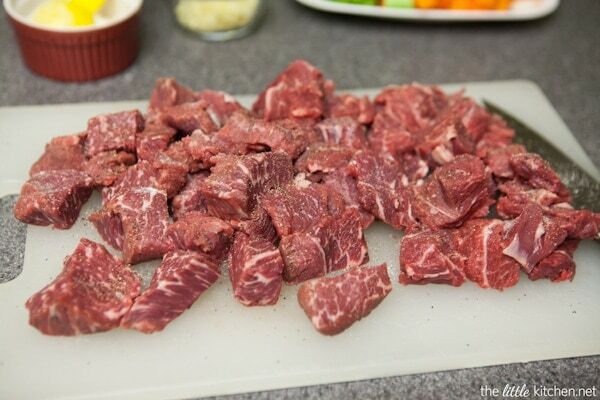 Remove the beef once it’s browned. 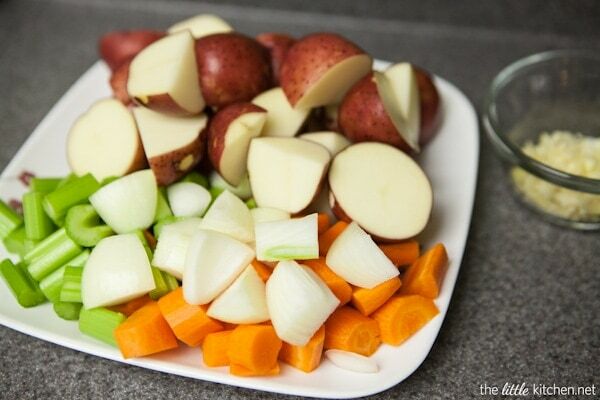 Add the vegetables and cook for 3 minutes. Add garlic and stir and cook for 1 minute. Add potatoes and cook for another 2 minutes. Add the red wine, broth, thyme and bay leaves. Put the lid on top and follow the instructions on the to make sure the vent is closed. Lock the lid and set the pressure cooker to High Pressure. Set the time to 60 minutes and hit start. Set your timer to 40 minutes. After 40 minutes, open the vent on the pressure cooker lid. Don’t take the lid off of the pressure cooker until it stops hissing, meaning all of the pressure has been released. Remove the lid and skim the fat off of the top with a spoon. Taste the beef and if it’s tender, it’s done. If not, put the lid back on, set the vent to closed and cook longer in 10 minute increments. 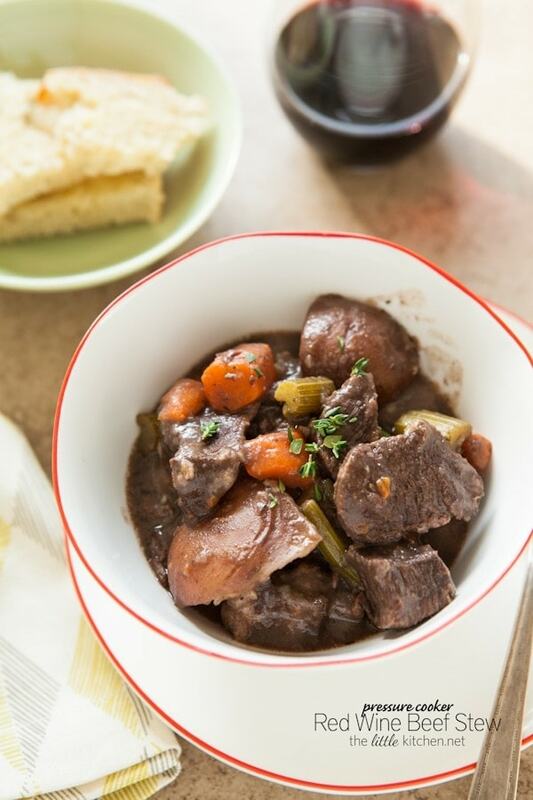 Serve the beef stew with some crusty bread and red wine. 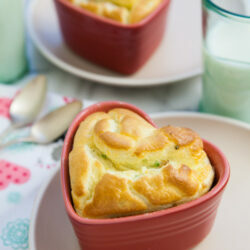 It’s lovely for this weather, the perfect comfort food. And even better, it tastes even better the next day! 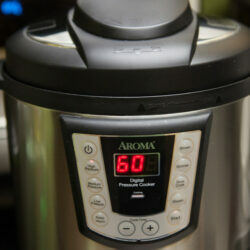 And be sure to check it out, I’m giving away an Aroma pressure cooker! Prep vegetables and then beef. Rinse beef and pat dry with a paper towel. Cut the beef into 2 inch pieces, trimming most of the fat. Season cuts of beef with salt and pepper. 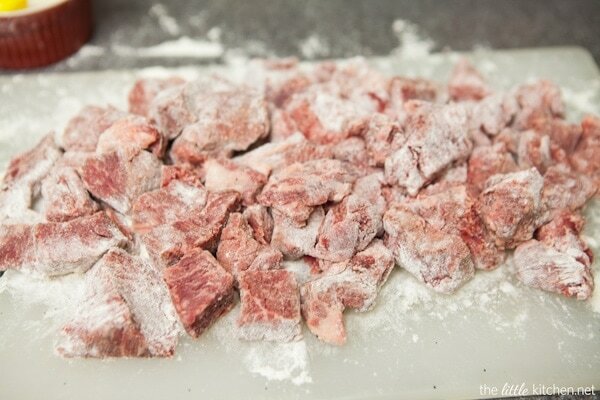 Sprinkle pieces with flour on the beef (you may not use all of the flour). Set pressure cooker to Brown and set time to 25 minutes. 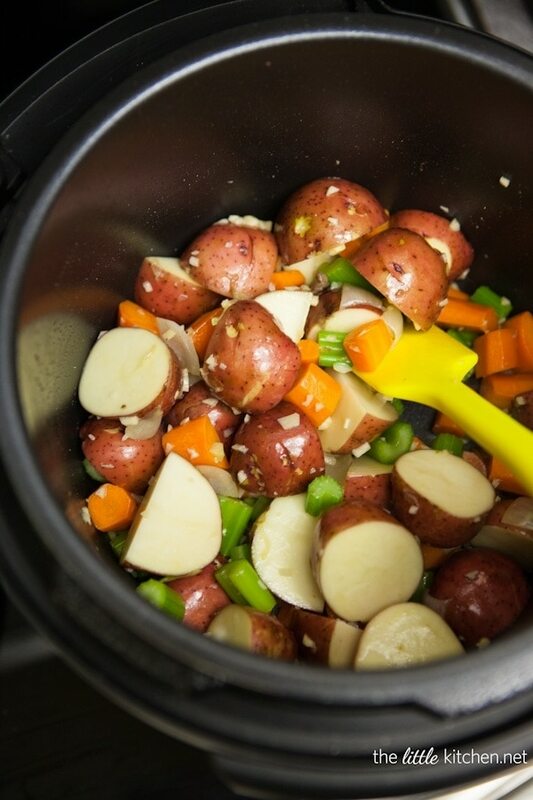 Add 1 Tablespoon oil and allow the pressure cooker to heat up for 2 to 3 minutes. 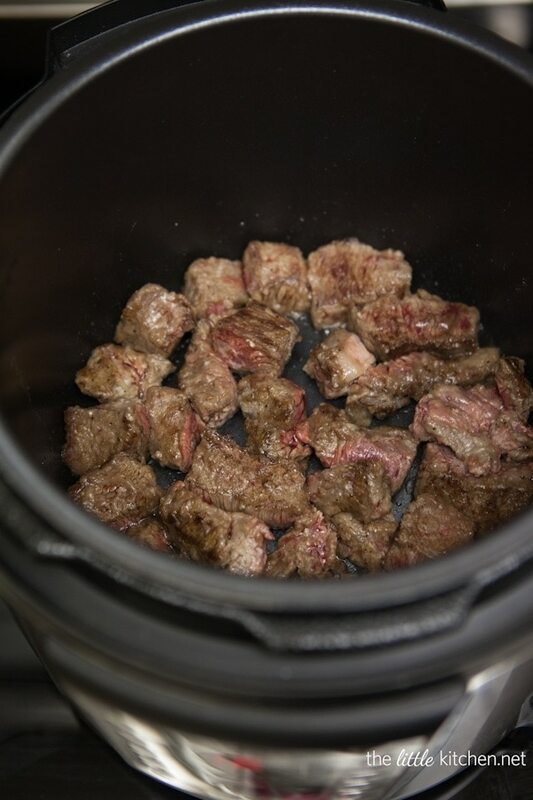 Brown beef on each side in batches, about 2 to 4 minutes on each side, adding more oil if needed. 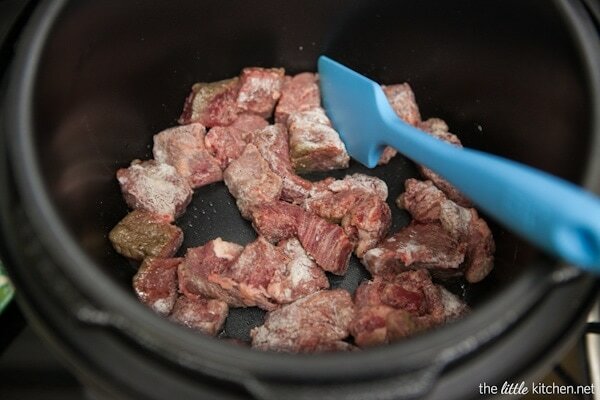 Remove beef and place on a clean plate and set aside. 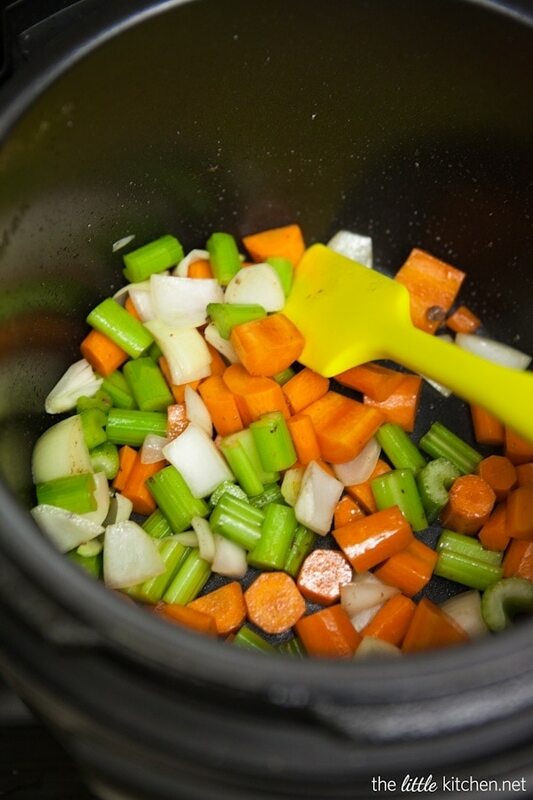 Add carrots, celery and onions to pressure cooker, cook vegetables for about 3 minutes or until aromatic and slightly browned, stirring occasionally. Add garlic and stir and cook for 1 minute. Add potatoes and cook for another 2 minutes. Return beef to pressure cooker and add red wine, broth, soy sauce, dried thyme and bay leaves. Season with salt and pepper. Mix with a rubber spatula. Place lid on top of pressure cooker and turn to closed position. Make sure the vent on top is set to closed as well. Set pressure cooker to High Pressure for 40 minutes. Release the pressure (set vent to open and allow pressure to release until there is no more hissing noise) and check beef and potatoes, if beef is tender enough to cut with a fork and potatoes are cooked, cooking is complete. Skim the fat on top with a spoon and remove bay leaves. Optional: Leave pressure cooker on warm until ready to serve. 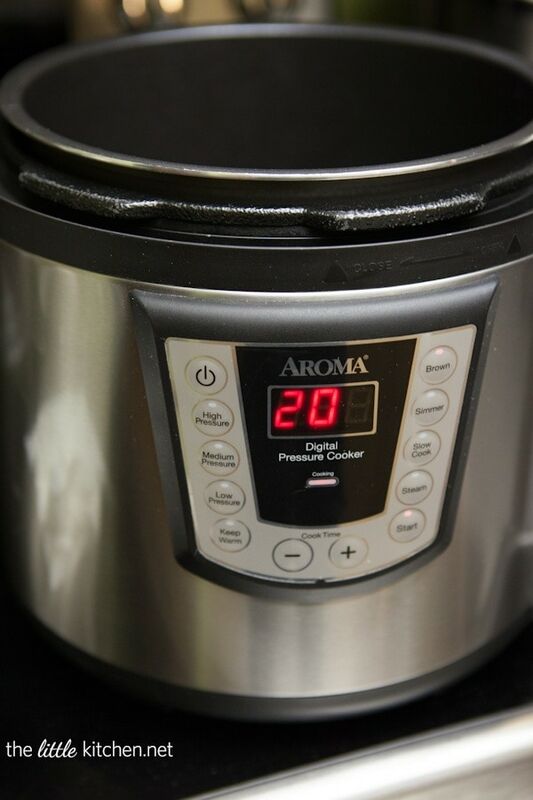 Disclosure: I received a pressure cooker from Aroma Housewares for the purpose of review. I only work with brands I love and only share with you my own opinions. There are affiliate links in this post. I dont have a pressure cooker. 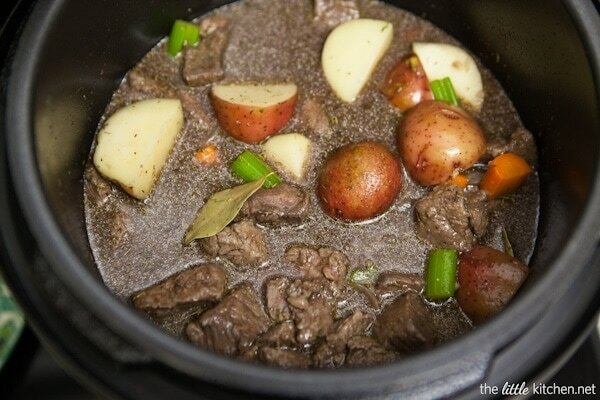 Would your yummy stew work simmering on the stove or in the oven? I hope you do more pressure cooker recipe, I got one for Christmas. This looks great. Looks incredible, Julie! What a perfect cozy winter meal! This looks so good! I need to get me a pressure cooker! It’s soooooo cold here. I’ve never done any pressure cooking but I really want this stew!! Beautiful stew, Julie! My mom used to use a pressure cooker, but I have never used one myself. I’m definitely intrigued to try it! 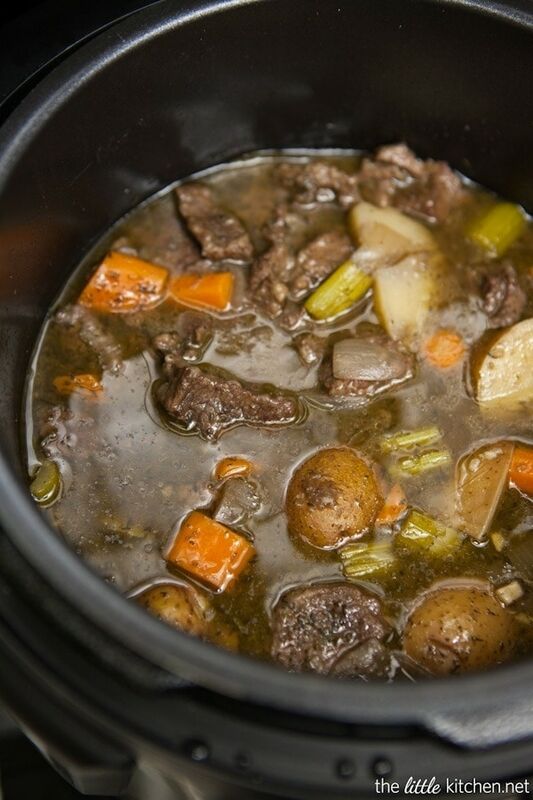 Today requires a good stew. This looks fantastic, Julie! I love the idea of making it in a pressure cooker! Pinned! Beautiful, Julie. I seriously need to learn how to use a pressure cooker. This looks amazing! Mmmm this looks amazing. My mom always made her beef stew in the pressure cooker but hers is a really, really old one that was ridiculously loud. But it was worth the noise, the meat comes out so tender. Larry would be over the moon if I made him this for dinner one night. 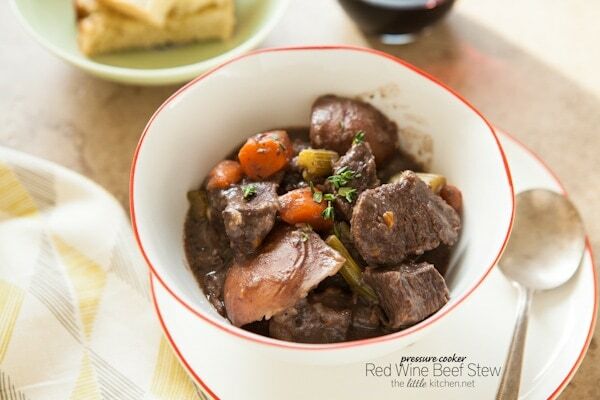 This looks incredible – I love how the house smells when you cook beef with red wine! Divine! I use a pressure cooker every day, it was wonderful. 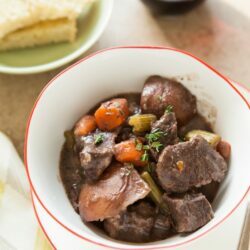 I will definitely cook beef stew as you instructed, it looks very tasty meal for a cozy winter. I made this tonight. It was amazing. I have and 8 qt pressure cooker, and I doubled the recipe. It filled it, and it was perfect at the recommended 40 mins high pressure. Yuuuummmy! Sorry about that! I just fixed it. I made this with my brand new pressure cooker I got today…this was fantastic!!! I wouldnt change a thing! I made this last weekend and it was superb. I increased the red wine to 2.5 cups and I left out the soy sauce because I didn’t have any, but apart form that it was as written. never tried the pressure cooker side of my Breville fast slow cooker before, I tried your recipe but added a few ingredients, green beans, pumpkin , sweet potato,baby potatoes”skin on” and red and green peppers. Turned out to be the best meal that I have ever eaten. I just made this soup tonight, following your recipe to a T. I only added some mushrooms, since I had them on hand. The recipe was DELICIOUS!!!! It has such a rich wine flavor and the meat came out perfectly tender. This is going to be one of my staples, and I am glad I found your site!! I have a question. What going to happen to potatoes after 40 min. of pressure cooking?